Tuesday, June 19, 1:00-5:30 P.M.
Thursday, June 21, 10:00 A.M.-5:30 P.M. Learn about how library works, how to find homework help, play games, and lots of fun activities. For grades 4-7. Registration is required and is already full. Check out how much fun we had in this 2011 camp video. Thursday, June 28, 2-3 P.M. Animated and interactive stories for kids of all ages. This program will be held in the library’s meeting room. Seats are limited. A free ticket is required to attend. Tickets are available 30 minutes prior to program start time. Thursday, July 5, 2-4 P.M.
Based on a series of comic books created by Belgian artist Hergé (Georges Remi). Directed by Steven Spielberg. Thursday, July 12, 2-3 P.M.
Join Patricia Shih, a multiple national award-winning singer-songwriter, for a fun-filled family concert full of laughter and joy! Thursday, July 19, 2-3 P.M.
Join Mr. Shap, a magician and balloon twister for his amazing ” Super Happenings Always Possible” show with us! This program will be held outdoors in the library’s patio. Some sitting areas may not have shade. Please wear a hat to shield the sun. Thursday, July 26, 2-3 P.M.
Don’t miss Steve Chaney’s hilarious show with Corny Crow! It’s so funny that you can’t stop laughing. Tuesday, August 2 , 2-3 P.M. Participants will use some simple scrapbook and stamping techniques to create their cards. All materials will be supplied you just need to bring your creativity! For kids ages 10 and up. Space will be limited and tickets will be given out 30 minutes before the program. Every Tuesday and Thursday, August 7 – 30, 1:30-3:30 P.M.
A 4-week math preparation class for incoming 7th graders only. Classes are held every Tuesday and Thursday during the month of August. Get ready for junior high math. Learn basic algebra concepts with Jonathan Lu, a USA Junior Math Olympiad qualifier from MSJ High School. Registration is required. Limit to 20 seats. Another year has gone by. I’d like to share a video of the major events at our library in 2011. 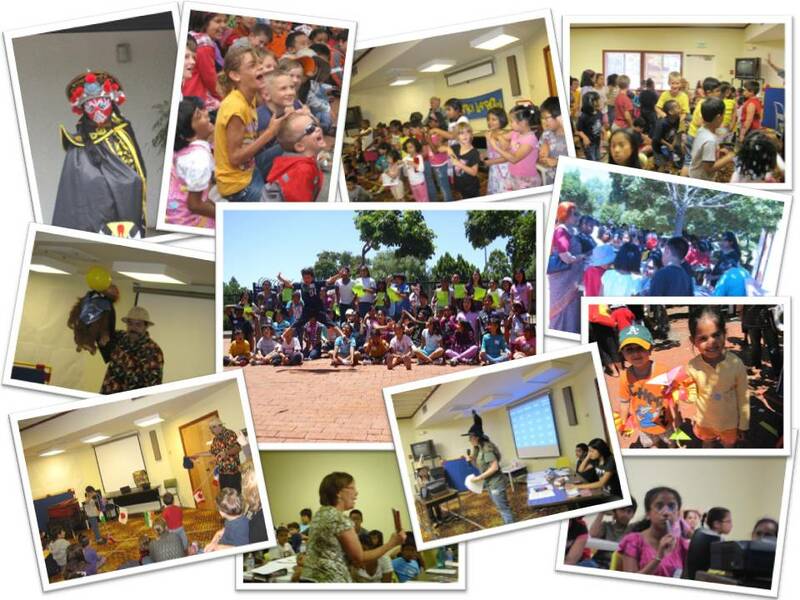 It was another busy year with many fun and/or educational family activities. The happy faces in this video make me feel rewarded and look forward to the coming year. Enjoy the video and have a wonderful 2012! *Video quality can be adjusted to HD but the playback may lag on some computers. What a Fun and Cultural Summer! We will have another summer program on August 4 featuring Thomas John, a very funny juggler. It will be held outdoors in the library’s patio. Don’t miss Centerville Library’s last show of the summer! Tuesday, June 21, 1:00-5:30 P.M.
Thursday, June 23, 10:00 A.M.-5:30 P.M.
A 2-day camp for kids entering 4th-8th grades. Classes include the library and library jobs, resources for homework help, Internet safety and cool websites, making multimedia posters, Jeopardy Game, carfts and more. Registration required and is already full. Check out how much fun we had in this 2009 camp video. Tuesday, June 28, 4 P.M.
Bring the whole family in to hear about other continents straight from the animals that live there! Ventriloquism and a touch of magic! This show will be held outdoors in the library’s patio. Some areas may not have shade. You are advised to wear a hat to shield the sun. Thursday, July 7, 2 P.M. Songs, stories, and riddles brought to you by legendary children’s entertainer Gary Lapow. This show will be held in the library’s meeting room. Seats are limited. A ticket is required to attend. Tickets are free and will be available at the Information Desk 30 minutes prior to the begining of the show. Thursday, July 14, 1:30 P.M.
Magic + climbing in a giant balloon + 變臉Bian Lian (what’s that?) + more! This show is full of surprises and excitement! The show will be held outdoors in the library’s patio. Some areas may not have shade. You are advised to wear a hat to shield the sun. Tuesday, July 19, 2-5 P.M. So you’ve read the books, you’ve seen the movies, now it’s time to play Jeopardy! Registration is required. Click HERE for more details. Thursday, July 21, 2-5 P.M. Calling all Harry Potter super fans! Tuesday, July 26, 2-4 P.M.
Come have fun making crafts of other cultures and play games, and get your name translated into other languages! All materials are provided. Some part of this event will be held outdoors in the library’s patio. You are advised to wear a hat to shield the sun. Thursday, July 28, 4 P.M. Learn how to make jewelry and take home your beautiful project. Keep it for yourself or give it to someone you love. For teens only. Limit to 25 seats. A ticket is required to attend. Find out how to get tickets HERE. Thursday, August 4, 2 P.M.
Bring the whole family in to watch Thomas John’s hilarious juggling show! You will be laughing out loud the entire time!